(Reuters) - Ukrainian President Viktor Yanukovich pressed on with a legal move on Friday that could rule his biggest political challenger, world heavyweight boxing champion Vitaly Klitschko out of elections in 2015. 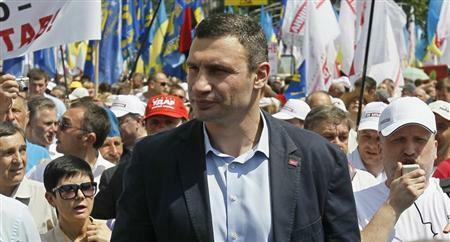 UDAR (Punch) party leader Vitaly Klitschko (C) takes part in a rally in Kiev May 18, 2013. Yanukovich, under pressure politically from falling popular ratings, signed into law legislation passed by parliament last month to ban anyone who pays taxes abroad from claiming residency in Ukraine at the same time. Candidates for the presidency must have been resident in Ukraine for the 10 years preceding the ballot and the law is widely seen as having been aimed at ruling Klitschko - who has often trained and fought in Germany - out of the race. Klitschko responded to the law's passing last month by formally announcing his run for president and his UDAR party responded defiantly on Friday, raising the prospect of a confrontation over the issue by saying the law could not keep him off the ballot. "The authorities have no grounds to keep Klitschko out of the election," his spokeswoman said. "Vitaly Klitschko will run for president regardless of any amendments to the law." UDAR, a pro-western liberal group founded in 2006?? ?, also said passage of the law was marred by procedural violations but did not give details. Yanukovich's main political rival, former prime minister Yulia Tymoshenko, is serving a seven-year jail sentence for abuse of office. Western powers are seeking her release. Polls show the 42-year-old reigning WBC heavyweight champion would be the strongest challenger to Yanukovich or a candidate backed by Yanukovich in the 2015 election if he made it onto the ballot.